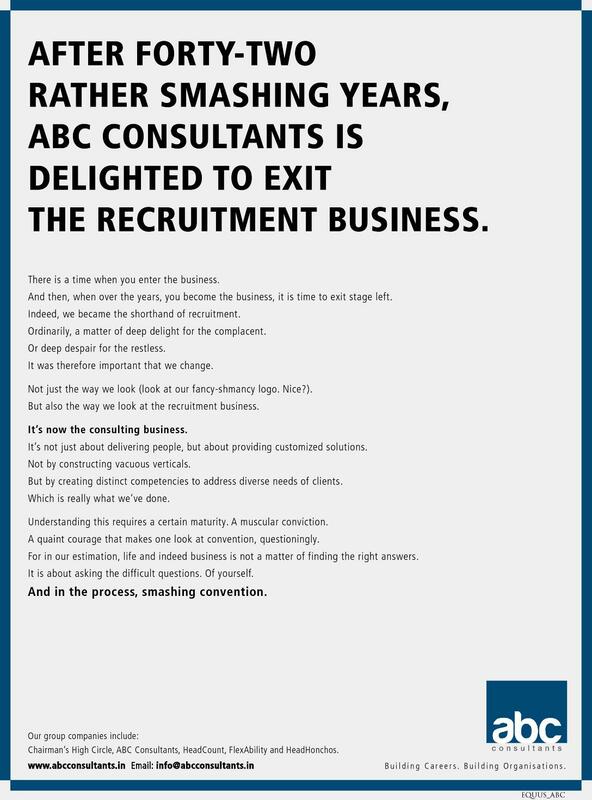 I came across this bold advertisement from abc Consultants that kept me thinking. I was curious to figure out why abc consultants took such a bold step. I believe I have the reasons. In this blog, I would pen down the changes in the talent landscape that is mandating changes in the business of recruitment. Hopefully it will help us get better prepared to accommodate these changes. This century has experienced movement of economy from being a manufacturing driven to a service driven. The above principles, division of labor and assembly line concept, were applied to service industry too and thus services too have experienced extreme job division and classification ultimately leading to job super specialization. Super specialization is a vicious circle because any specialization leads to systemic rigidity which creates need for further division of labor and classification and the chain continues. As a result of wider funnel, companies are creating more interviews rounds to ensure only prequalified candidates take time of hiring managers. Companies are talking of War for Talent however we still see many job seekers in the market. This is because talent is not able to switch between super specializations. Recruitment firms keen on avoiding the above trap should train their recruiters to address niche requirements. Since most requirements will tend to become niche, the overall market will expand thereby benefiting the firm. Recruiters should also be trained to interact directly with hiring managers to ensure there is no loss of data (Chinese whisper loss). In specialized jobs, details play a vital role. Since positions are niche, recruiters will need to scrutinize several profiles before they come across a fitting profile. I could liken this searching for the right person to Edison’s 1000 filament tests! Thus recruiters need to be given right technology platform to approach recruitment in a systematic fashion with great rigor. Very small firms will find it difficult to attract and train and retain expert recruiters since the demand will far out strip availability. Also training is a specialized function that needs very close attention and professional management and resources. Every industry is cyclical. Small firms attempting to specialize in spite of above challenge would find that they are in a position to address only a few sections of an Industry. Thus during a down turn in the industry will result in loss of short term capital to run business. If fluctuations become too frequent, then sustaining without operating in several industries, effectively hedging one industry over other, will become impractical. The above two reasons could push out less competitive firms out of market pushing the supply down and thus bolstering a recruitment firm’s bargaining powers. Therefore surviving firms would experience better profitability if they successfully manage to control cost to existing levels.